From the National Geographic article featuring ACORN International ragpickers. Mumbai Vinod Shetty, ACORN India’s Director, and I had been meeting for hours along Juhu Road at the Sip ‘N Munch going through our work list of what needed to be done on campaigns around remittances, the Commonwealth Games, and multi-national food contractors and their labor law violations. We had discussed the great progress of our Dharavi recycling center. He had told me the good news that Joseph Campana’s project for us of producing a book that would support our Dharavi work finally had a publisher in Harper-Collins-India. We had talked about the prospects for acquiring a set of scales and a crushing machine to be able to raise the prices for our plastic recycling and increase our waste pickers wages. We had checked the dates and filings on our paperwork for the ACORN Foundation (India). We had discussed our efforts to repackage and sell products being produced in Dharavi for Diwali and other festival dates to our school recycling partners like Eco-Mundial and the American School. We had taken notes for reports owed to our friends at BCGEU and SEIU. There were a lot of items ticked off the list. Finally at that point Vinod pulled out a staff of glossy magazines and newspapers with almost a blush. The magazines ran the gamut. One was the Clean India Journal which focused on environmental progress for companies, contractors, and others in India and featured our work in September in a piece called, “Waste Matters for Green Workers” about our ragpicker organization in Dharavi. Another in a the “green” issue of an upscale fashion monthly called Jade and style magazine was entitled “Green Heroes: Ragpickers or City Savers?” (Access both on our website at www.acorninternational.org) Later he forwarded me another piece published on several websites by a Londoner which was not quite as gushing but referred to our ragpickers as “invisbile heroes” in http://www.chinadialogue.net/article/show/single/en/3790-Invisible-heroes-of-Dharavi. An article distributed for school children in a “weekly reader” style publication called Robin Age also contained a recent feature. mighty oaks for this Acorn. Wow! Feeling the love in Bombay! What a pleasure to read for a beaten down veteran of the USA based searches like me which are dominated by right wing zealots, conspiratorialists, and general haterators. Why doesn’t Google search worldwide for me?!? Laxmi and several others form the recycling clan of Dharavi. And, they are all part of Acorn Foundation (India), Mumbai, a registered charity trust affiliated to Acorn International or the Association of Community Organisations for Reform Now. Acorn International is a community based NGO working in 12 countries across the world. It has been fighting on issues like right to affordable housing, living wages, water, sanitation, education and healthcare in India. One of their projects – the Dharavi Project – Acorn aims to organise and train the ragpickers in scientific methods of waste handling, segregation and recycling. 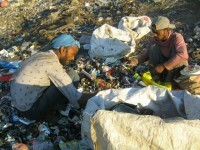 Besides Mumbai, the organisation also works to improve the lives of the ragpickers in cities like Delhi and Bangalore. I looked down at Shetty’s desk where a series of small ID cards were carefully laid out, identifying recyclers as members of the “Dharavi project”. An image of a young boy, who could not have been more than nine years old, gazed back at me, accompanied by a name in bold type: “Sameer”. For Sameer, this card is the difference between invisibility and visibility, anonymity and belonging. For India, it is a step on the long road to tackling the enormous waste challenge, and creating dignified, green jobs. One article had such a “crush” line about Vinod that he would have to be careful showing his wife the piece. It was great praise and a long way from building power, but as we rose it felt like progress in Mumbai for our rag pickers in this huge world capital of the poor. This entry was posted in Community Organizations International, Community Organizing, International and tagged ACORN Foundation (India), ACORN International, affordable housing, Bombay, Dharvi Project, Education, healthcare, India, ragpickers, recycling, sanitation, slumdwellers, Vinod SHetty, water by wade. Bookmark the permalink.